When Peggy Shippen, the celebrated blonde belle of Philadelphia, married American military hero Benedict Arnold in 1779, she anticipated a life of fame and fortune, but financial debts and political intrigues prompted her to conspire with her treasonous husband against George Washington and the American Revolution. In spite of her commendable efforts to rehabilitate her husband’s name, Peggy Shippen continues to be remembered as a traitor bride. Peggy’s patriotic counterpart was Lucy Flucker, the spirited and voluptuous brunette, who in 1774 defied her wealthy Tory parents by marrying a poor Boston bookbinder simply for love. When her husband, Henry Knox, later became a famous general in the American Revolutionary War, Lucy faithfully followed him through Washington’s army camps where she birthed and lost babies, befriended Martha Washington, was praised for her social skills, and secured her legacy as an admired patriot wife. And yet, as esteemed biographer Nancy Rubin Stuart reveals, a closer look at the lives of both spirited women reveals that neither was simply a “traitor” or “patriot.” In Defiant Brides, the first dual biography of both Peggy Shippen Arnold and Lucy Flucker Knox, Stuart has crafted a rich portrait of two rebellious women who defied expectations and struggled—publicly and privately—in a volatile political moment in early America. Drawing from never-before-published correspondence, Stuart traces the evolution of these women from passionate teenage brides to mature matrons, bringing both women from the sidelines of history to its vital center. 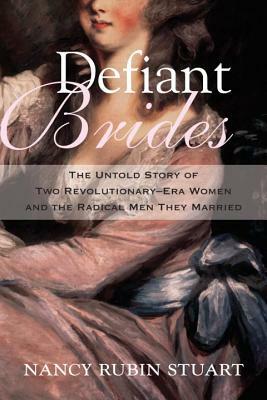 Readers will be enthralled by Stuart’s dramatic account of the epic lives of these defiant brides, which begin with romance, are complicated by politics, and involve spies, disappointments, heroic deeds, tragedies, and personal triumphs. Nancy Rubin Stuart is an award-winning author specializing in women’s and social history. She has appeared on national television and NPR and has written for the New York Times, among other publications. Stuart is a board member of the Women Writing Women’s Lives Seminar at the CUNY Graduate Center and executive director of the Cape Cod Writers Center. “In this lively double-biography, Nancy Rubin Stuart reveals the resilient lives of a leading patriot and a notorious Loyalist: both of them women.